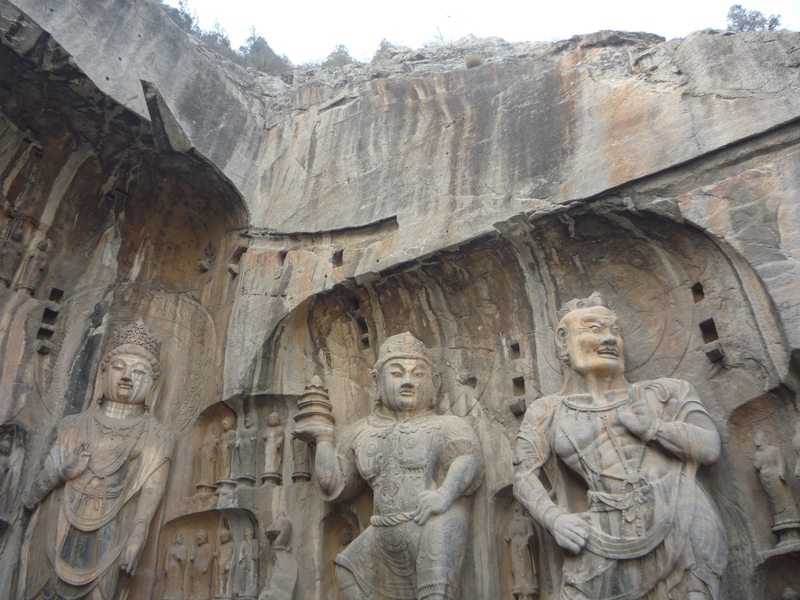 Luoyang is a city in the western Henan province of Central China. 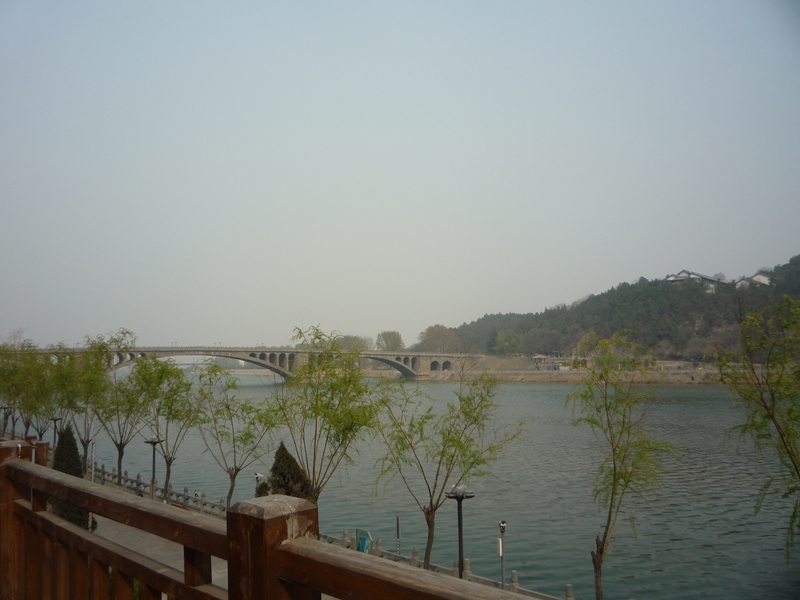 It borders the provincial capital of Zhengzhou to the east, Pingdingshan to the southeast, Nanyang to the south, Sanmenxia to the west, Jiyuan to the north, and Jiaozuo to the northeast. 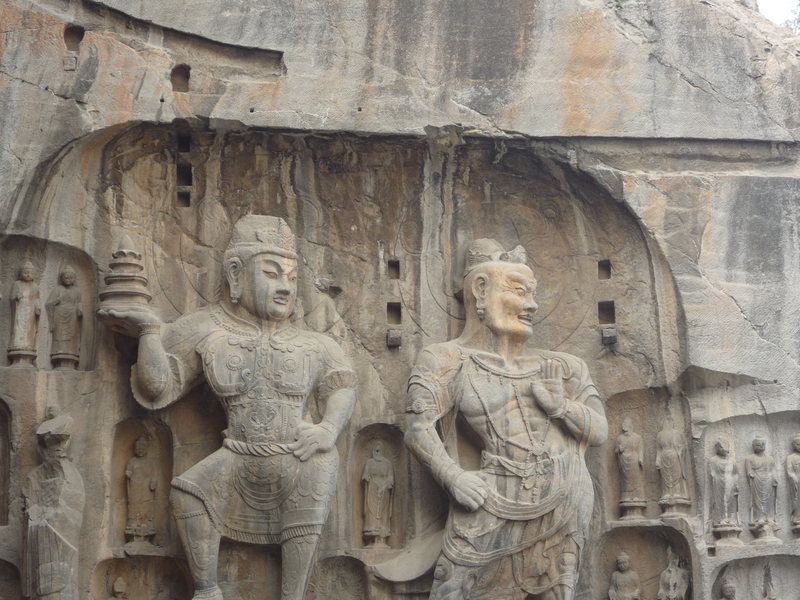 Situated on the central plain of China, one of the cradles of the Chinese civilization, Luoyang was one of the Four Great Ancient Capitals of China. That’s all well and good, Wikipedia, but what you fail to mention is that walking around outside in the city is like sucking on the end of a car’s tailpipe. Yes, the place served as the capitol for 13 ancient dynasties, but today its dusty streets, polluted air, and unending industrialization makes Luoyang a far-cry from the picturesque town that captured the fancy of the famous writer Bai Juyi during the Tang Period. 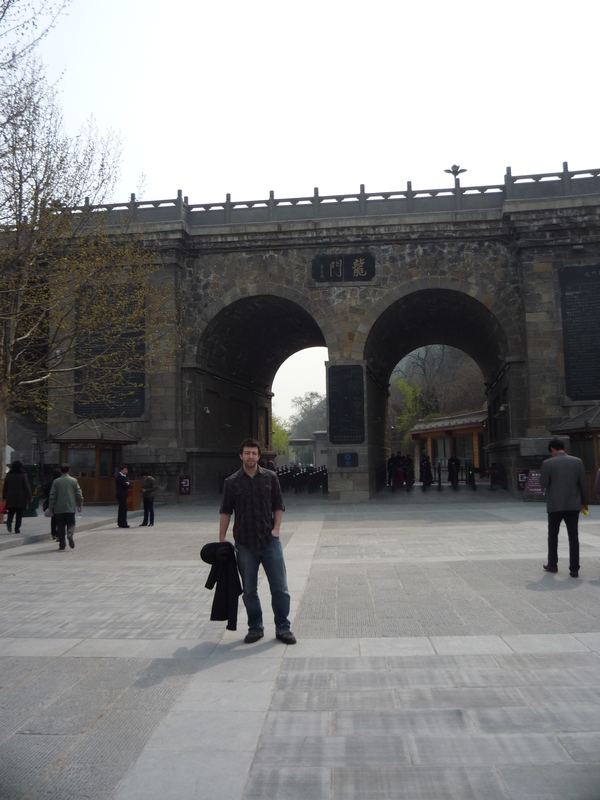 We got to the city by taking the High Speed Train from Xi’an. Getting the sword through security proved a bit easier since we had wrapped that baby up tightly. They still insisted that I not take it out and swing it around while on the train, though. 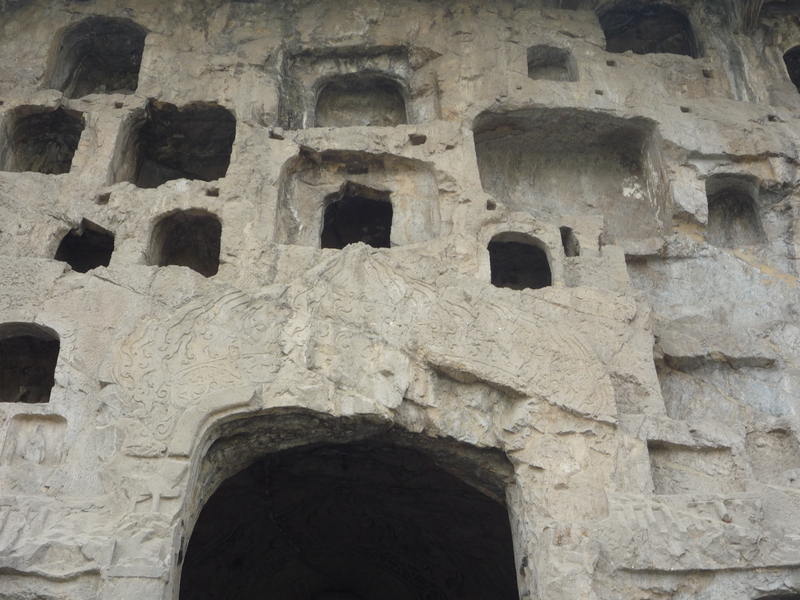 We took a bus to the youth hostel and got situated before heading out to the one redeeming quality the city has: Longman Grottoes. Now I’m sure I’m not giving the city it’s due credit, and since I was only there a day, I’m even willing to bet there’s more to the place than what I saw….but I just don’t care. Really, as I walked around outside in the heart of the city I could barely breathe. I got sick there after just eight hours. Anyway—the Grottoes. 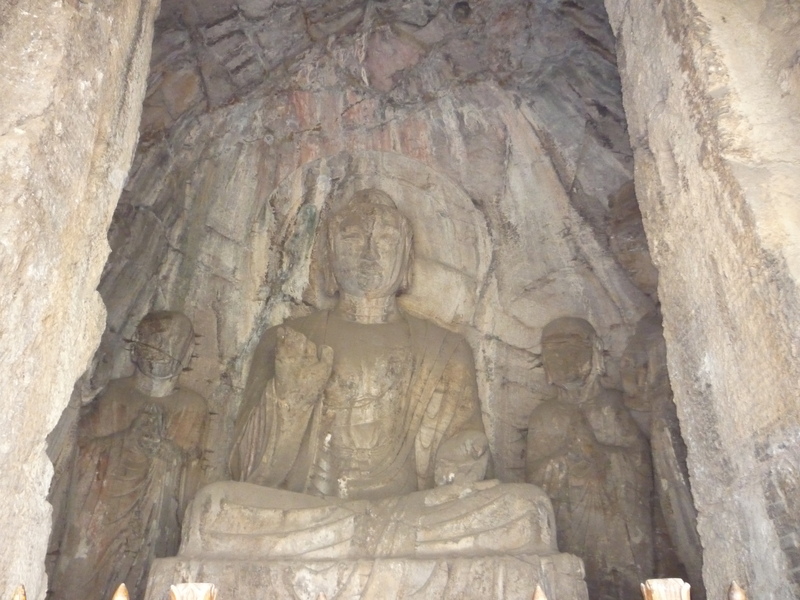 There are as many as 100,000 statues within the 1,400 caves, ranging from an 1 inch to 57 feet in height. 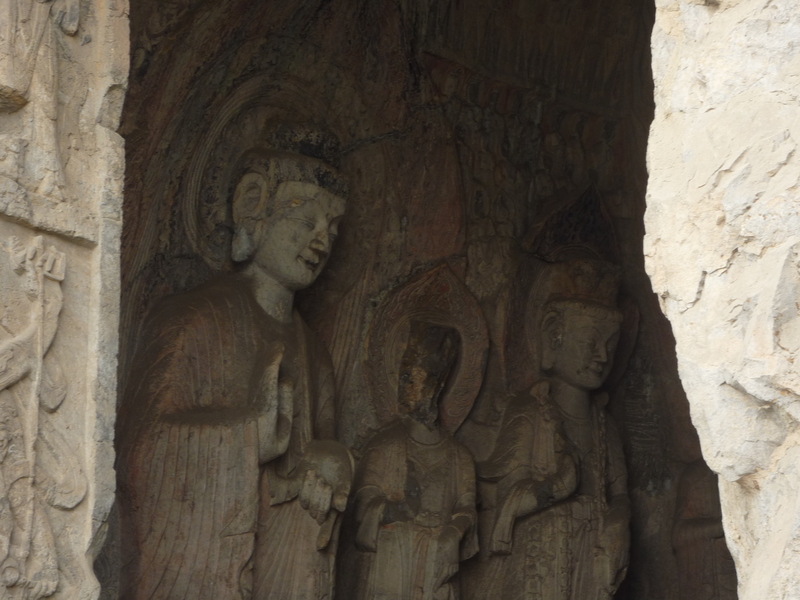 The area also contains over sixty Buddhist pagodas. 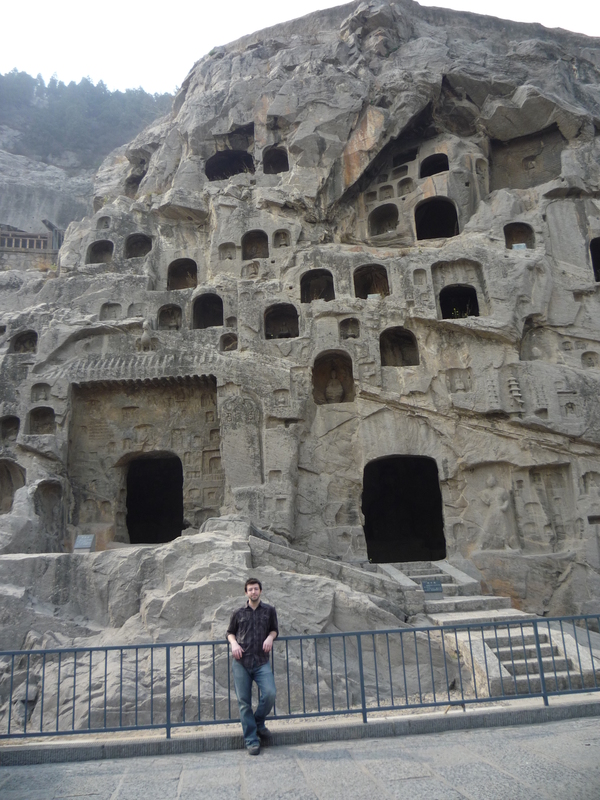 Situated in what is probably the most scenic area in the whole darn city, the grottoes were carved from a stretch of cliff running along both banks of the river. 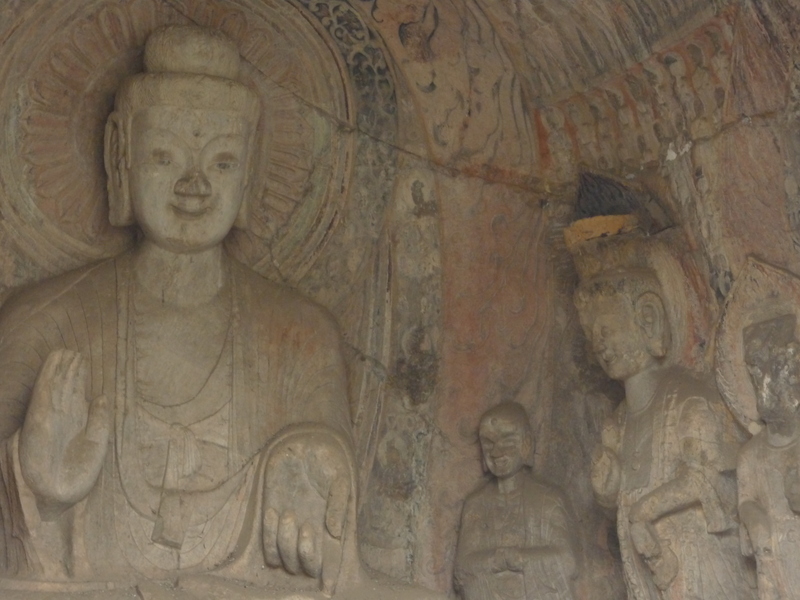 30% date from the Northern Wei Dynasty and 60% from the Tang, caves from other periods accounting for less than 10% of the total.Starting with the Northern Wei Dynasty in 493 AD, patrons and donors from the highest echelons of society endorsed artists to add to the site, even the first female emperor, Wu Zetian got involved. 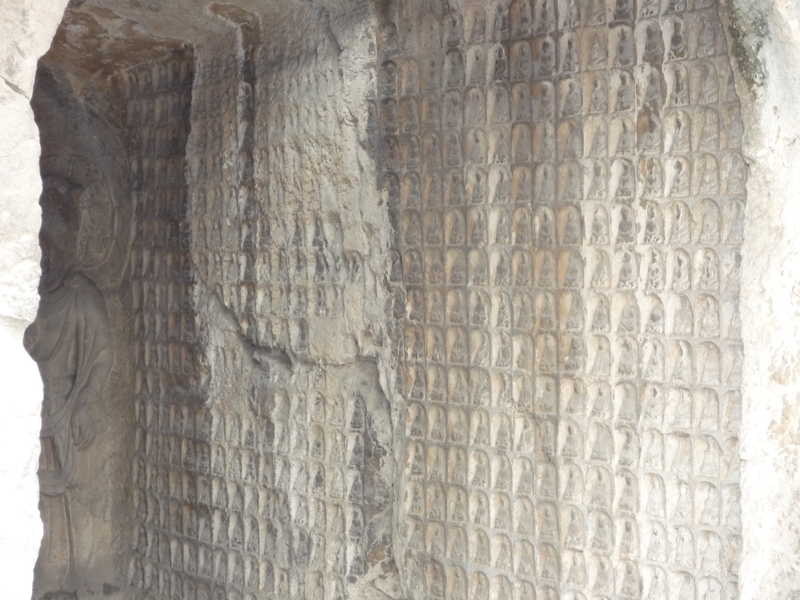 This place basically became a spot of great spiritual significance, and a place to one-up who ever had carved or paid to have carved the previous grotto. 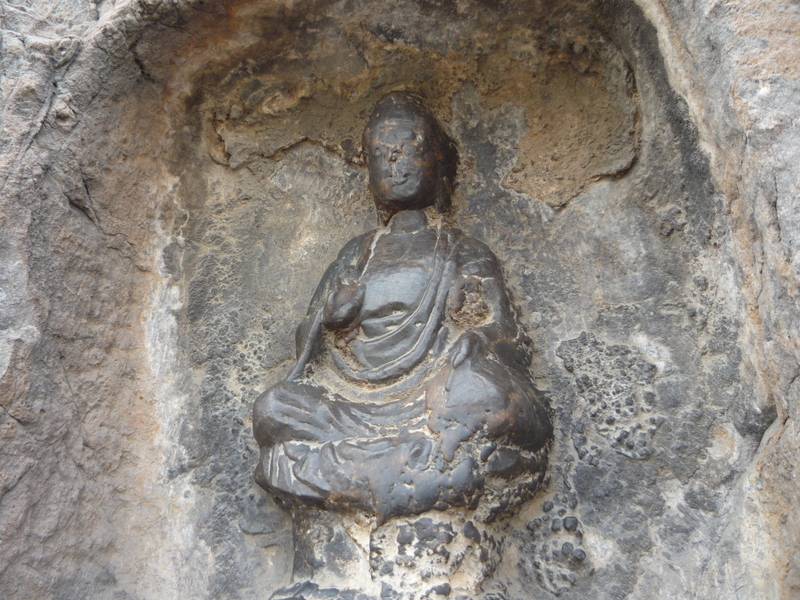 All along the side of this mountain there are different size and styles of Buddha. There is no concept of planning things out or even the tried and true, “My side, your side.” The whole site seems like a bunch of very talented graffiti artists just decided to bum rush the mountain over a period of several hundred years. The mastery is simply amazing, no doubt, but by about the halfway point you start to glaze over a lot of what you’re seeing. 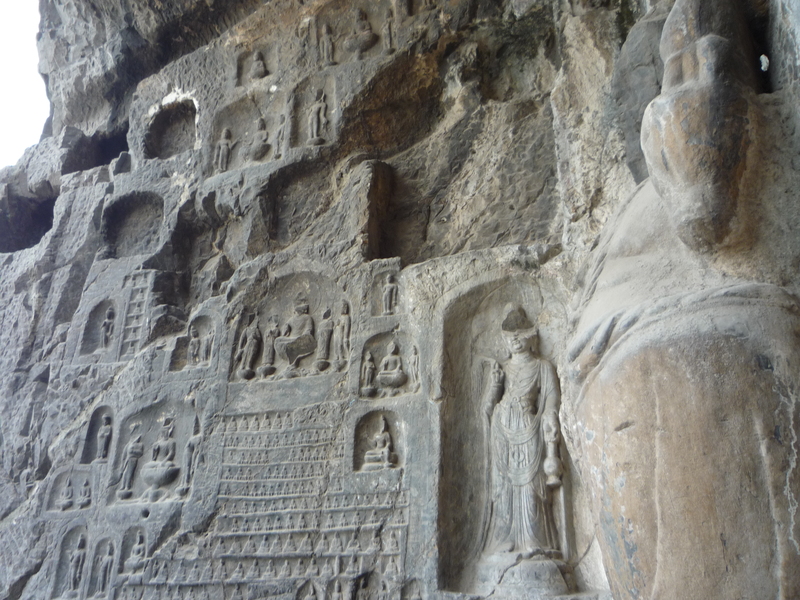 There are just SO MANY small caves with carvings. Too much detail all jammed together. 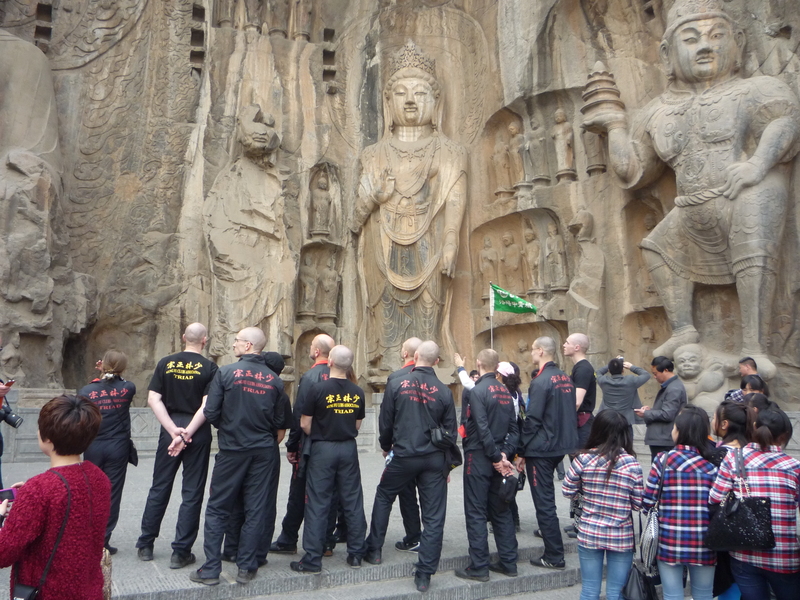 While at the BIG Grottoes a group of foreigners—all with shaved heads—were attracting a lot of attention because of their shirts. They were a part of some Kung Fu school. They all looked athletic and like actual practitioners, but Xiao Ming said their shirts didn’t make a lot of sense since the designs were from two belief systems and the Chinese characters didn’t have significant meaning. I’d heard of schools that people could visit, even monasteries and temples that let people pay to stay and train at their facilities. I wondered if this group was like that…Either way, they were the stars of the stage. High schoolers and middle schoolers on fieldtrips flocked them and snapped pictures like manic little paparazzi. But when the baldies left, I was the only white face around. We tried to be discreet, but that just doesn’t work most of the time here. The focus of about fifty school-age teens turned to me, and I was coaxed into posing for a handful of pictures before we got away. 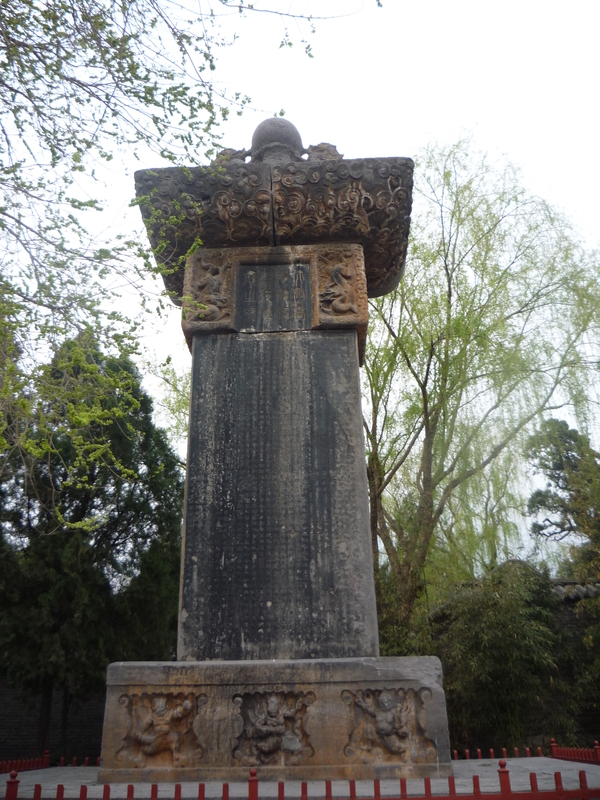 The whole site also includes the Xiangshan Temple, Bai Garden, and the tomb of the famous Chinese poet and writer, Bai Juyi. 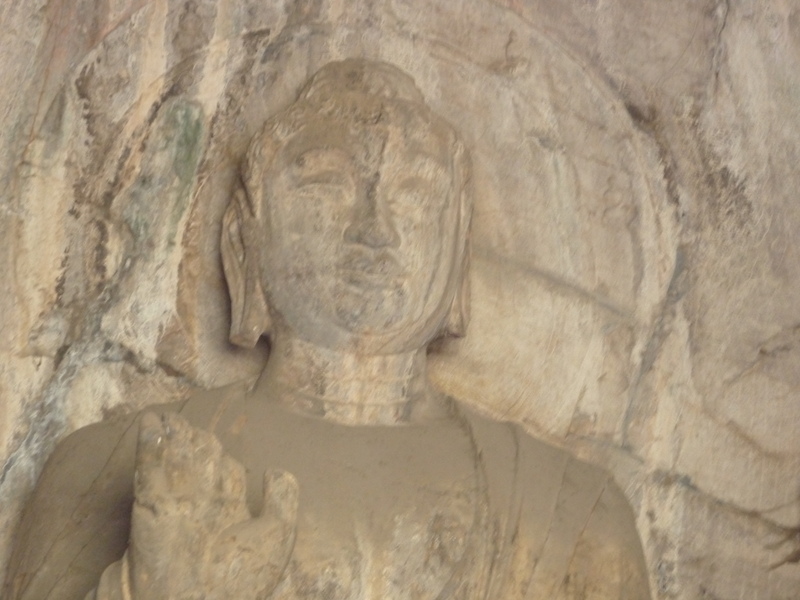 The writer lived in Luoyang during his later years. We meandered around the whole place, taking in the sights, history, and enjoying the lack of floating dust particles the size of ping-pong balls. Afterward, as we were walking out, I tried to find some good postcards, but all of them looked like they were from the seventies, and the merchants wanted too much. 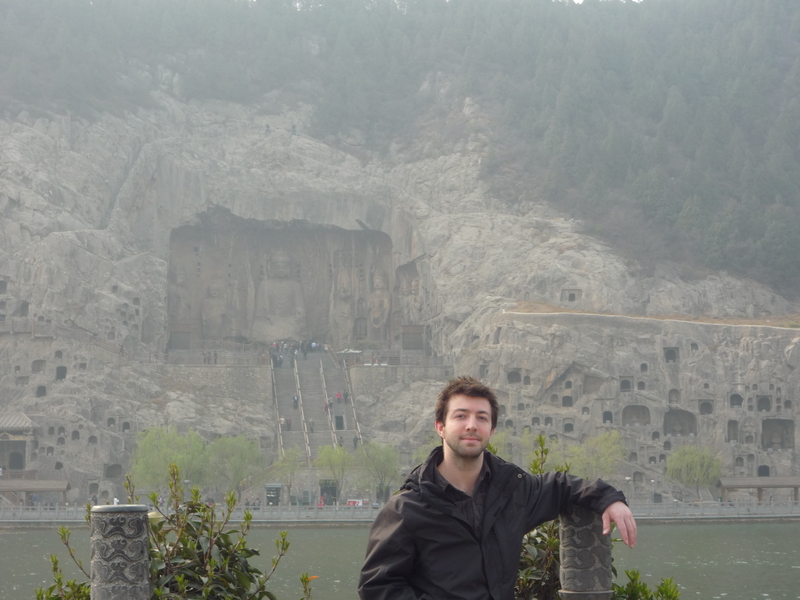 I shrugged it off and decided to just find some at our next big destination when we got there: The Shaolin Temple. 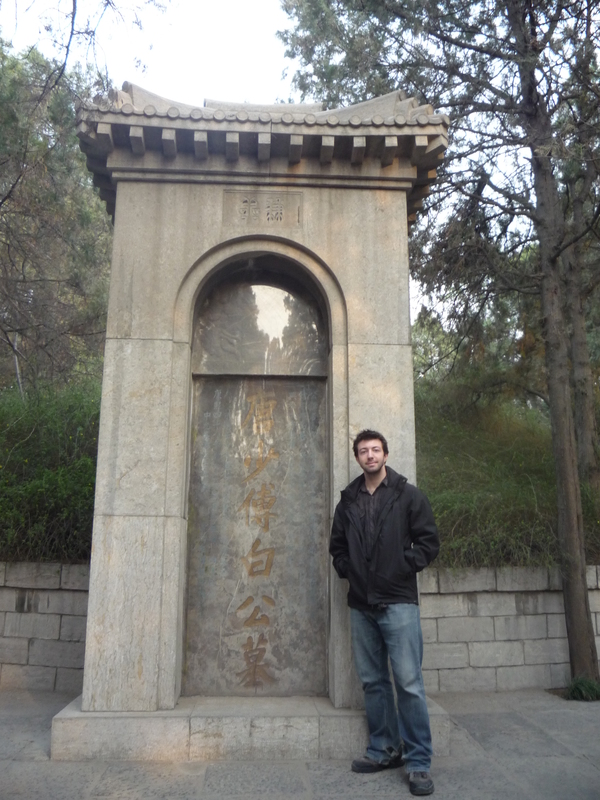 This is the Big Tang Stone…seriously, that’s what it’s called…was put here wayyy back in the day. In the evening I wasn’t feeling well (told you I got sick), so I checked some things out online, chatted with a few other guests in Chinese, and then turned in early. 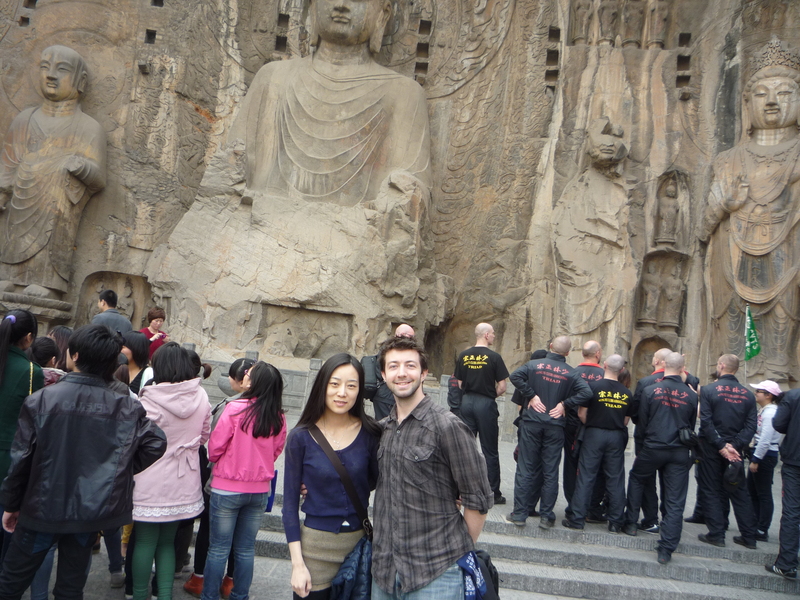 We left after breakfast the next day and boarded another train to the city of Zhengzhou. 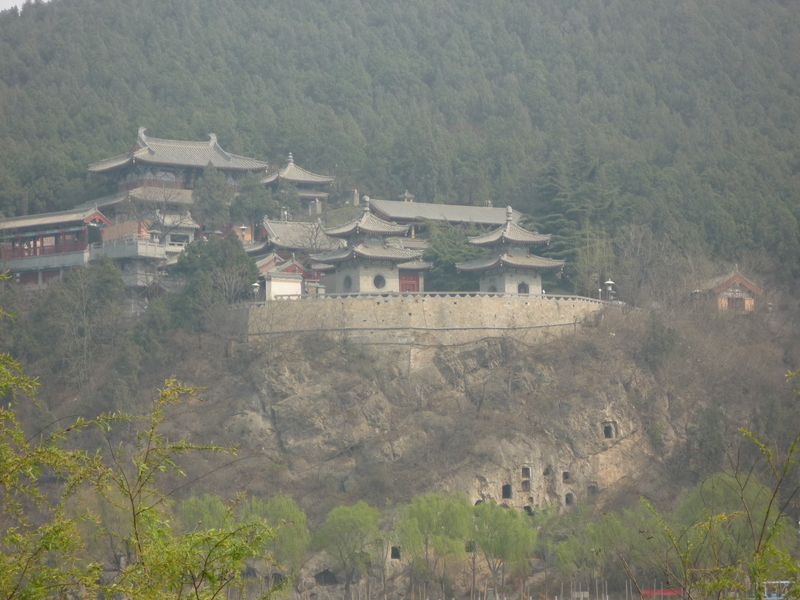 In retrospect, I have no idea why we didn’t just travel directly to Song Shan, the Sacred Mountain on which the famed Shaolin Temple is located. I think it was something about a museum or whatever, something we could do or see in the city for one day before heading over to the second sacred mountain of the trip. We were wrong. It was raining when we got there, but the place was a typical Chinese city: cramped, polluted, and full of scents you’re not entirely sure aren’t aromatic poisons. The weather did nothing good for the cold that had begun to ravage my head, and having the hostel we booked before coming tell us—when we got there and were standing in the damn lobby—that they couldn’t accept foreigners didn’t help much. Yeah, we were tired, wet, and I was sick and the three girls behind the counter just looked at me like they’d never seen a white face. When they went about trying to explain how the city doesn’t allow most hostels or even smaller hotels to house foreigners I wanted to pull my hair out. They flitted and fluttered like crazy hens, moving and shifting papers, looking around with confused expressions. They reminded me of a female set of the three stooges. Seriously, I was waiting for one of them to slap the other or poke ‘em in the eyes. Xiao Ming managed to track down a hostel and after a long conversation where she repeatedly made sure they could accept me, we made left. She told me that even the guy she spoke to on the phone sounded like an idiot. He mumbled, and spoke in fragments. This was the beginning of what we would come to later refer to as the “Zhengzhou Water” syndrome. 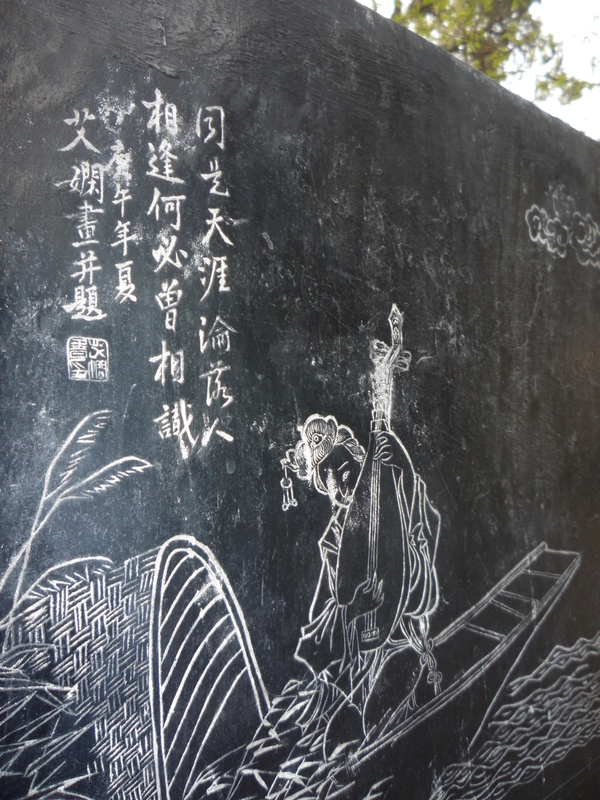 Most idioms in Chinese are comprised of four characters and have a story or history to give them their meaning. We came up with our own idiom: He Zhengzhou Shui (drink zhengzhou water). We still use it to explain any stupid behavior. “Ta men he zhengzhou shui,” they drink zhengzhou water, we say when something exceptionally stupid happens within sight. Once we tracked down the “hostel” I groaned. The building was obviously not a hostel, and by the looks of it, not even a legal place for human habitation. The proprietor of the joint had acquired a beaten up apartment building and taken to calling it a hotel. Walking through the darkened halls with paint peeling from the walls and vague, muffled sounds coming from behind some of the doors we passed, it was hard not to think of every slasher movie ever. The room was cold and damp, but the sheets looked dry and clean. Needless to say, not even getting to bed early helped my cold that night. I woke up the next day with a headache, sniffling, and probably running a fever, but I packed my bag up and we said so long to Slasher Inn. We kicked ourselves for even stepping foot in the city, but didn’t let the bad night keep us down long. We boarded a bus in the rain, and tried to relax as we headed to the last destination of the trip: Song Shan.